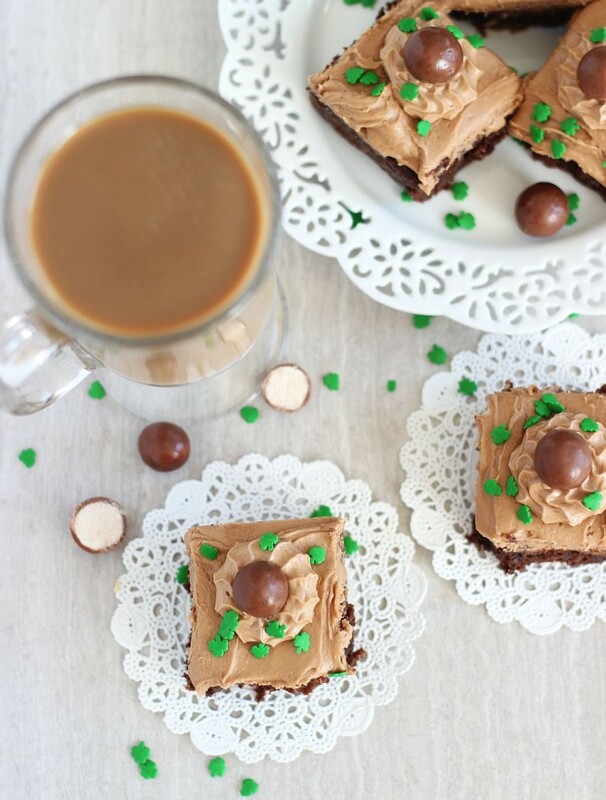 Box brownie mix is doctored up as a perfect St. Patrick’s Day dessert, with Bailey’s Irish Cream, malted milk powder, and a Chocolate Irish Cream Frosting! 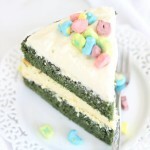 Confession: I’m really struggling with St. Patrick’s Day baking!!! I’m having a hard time getting things going with Guinness and Bailey’s. I feel like I don’t know what to do with these things besides drink them. Maybe that sounds like cause for concern? It’s not. We’re not big drinkers. Just wine. And I hardly think that counts… it’s basically juice. Instead, besides a handful of St. Patty’s appropriate recipes, I’ve been all about fruit lately. Fruit and coconut and all things light and refreshing. Pineapple, mango, kiwi. Because that makes perfect sense in the month of February. Wrong. It’s the coldest day we’ve had this winter (I’m in Florida – I won’t even tell you what our ‘coldest’ day temperature is – I know yours are worse! ), and yet I can’t stop thinking about strawberry shortcake, key lime pie, and the like. Who, besides me, is thinking about rum, pineapple, and coconut? Nobody, that’s who. Florida in February feels kinda spring-like though (except for today! ), so I’ve got it in my head that summer is around the corner. Also wrong. It’s far, far away. If you live here, that’s actually a good thing, of course. We don’t exactly love summer, but all the other seasons are stellar, so it’s worth enduring. Come June, I’ll be alllll set for fresh and fruity stuff, but I’m coming up dry for St. Patty’s Day. Pun intended. Nevertheless, I did manage to mix up these brownies and they were the fudgiest brownies I’ve probably ever had. They were so gooey and moist. I’m not into crispy and cake-like brownies, so these were right up my alley. If you like a dense and fudgy brownie, these are it. They’re made with Bailey’s Irish Cream both in the batter, and in the frosting. You can’t miss the Bailey’s, and the flavor is very much noticeable, but it’s also not going to knock you over with an alcoholic bite. Unless you want it to… I’m sure you could work some more in! 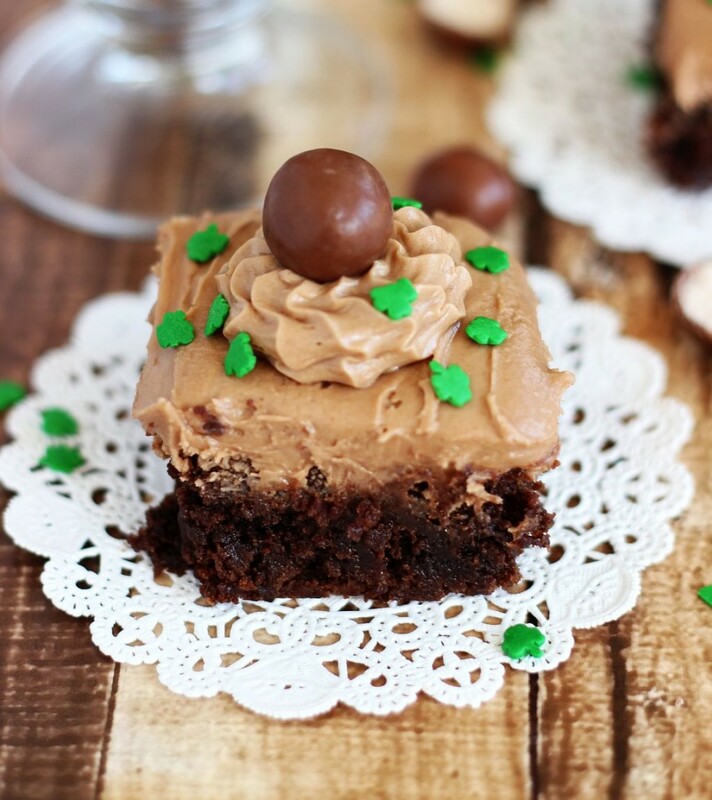 There’s a lot of Bailey’s brownies out there. You have your pick of recipes. 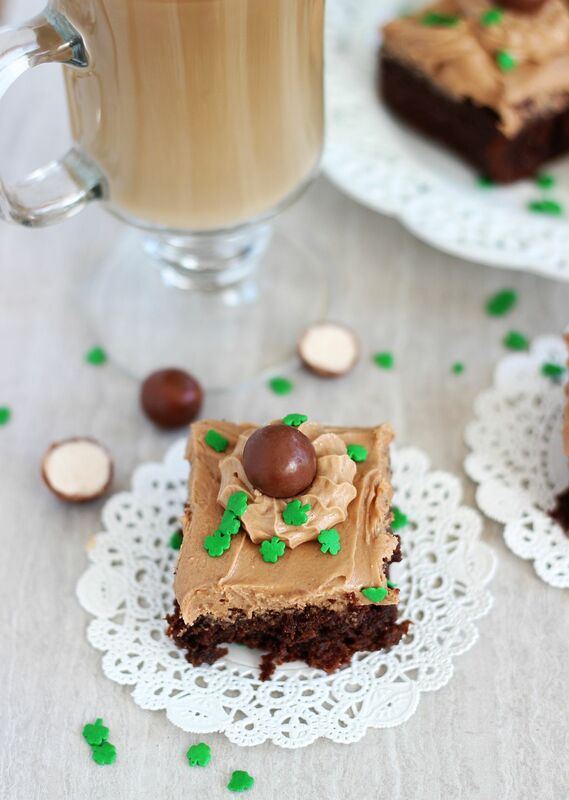 However, I thought that malted flavors might blend well with Bailey’s and cocoa, and would put a unique spin on the concept of Bailey’s in brownies. I’m happy to report that chopped malted milk balls and malted milk powder put an extra special flavor element into these brownies. 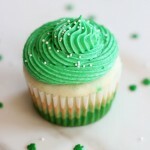 We made them twice just this week, and they will definitely make another appearance on St. Patty’s Day! 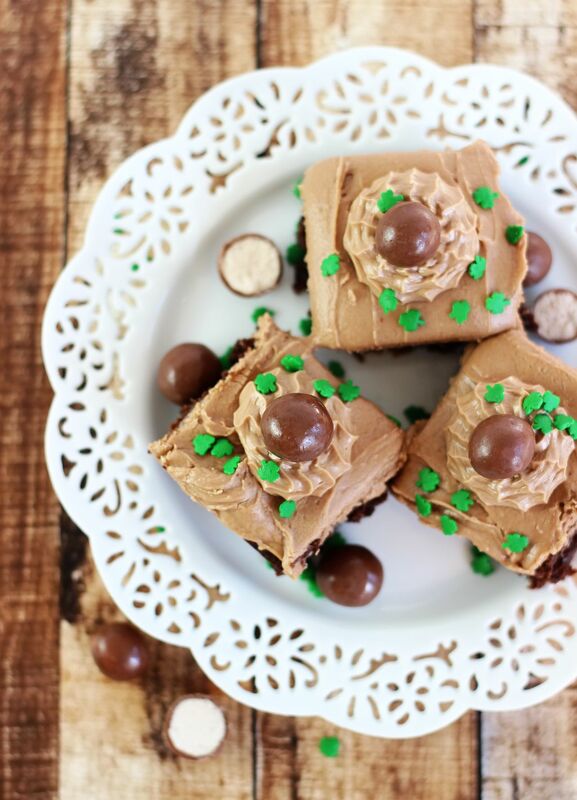 Box brownie mix is doctored up with Bailey's Irish Cream, malted milk powder, and a Bailey's Irish Cream Frosting! In a large bowl, combine brownie mix, Bailey's, oil, egg, and malted milk powder; mix well. 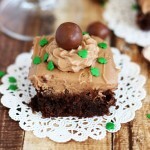 Fold in malted milk balls. Spread in a well-greased 8x8 inch baking pan. In a large mixing bowl, combine all frosting ingredients. The brownies look super delicious Sarah! I have never tasted or worked with Bailey’s Irish Cream so know idea how it tastes like but it definitely looks amazing! These brownies are too cute! Love the flavors! Yeah, I wonder if you can find malted milk powder in Canada? Probably, right? It’s where the baking stuff and regular powdered milk is! I have hardly done anything for St. Patty’s day – I’m way behind the ball on this! Haha! These look like they are to die for! I can’t wait to try them. I have Bailey’s Irish Cream coffee creamer in my coffee every day, so this is right up my alley! They’re extremely rich and delicious! 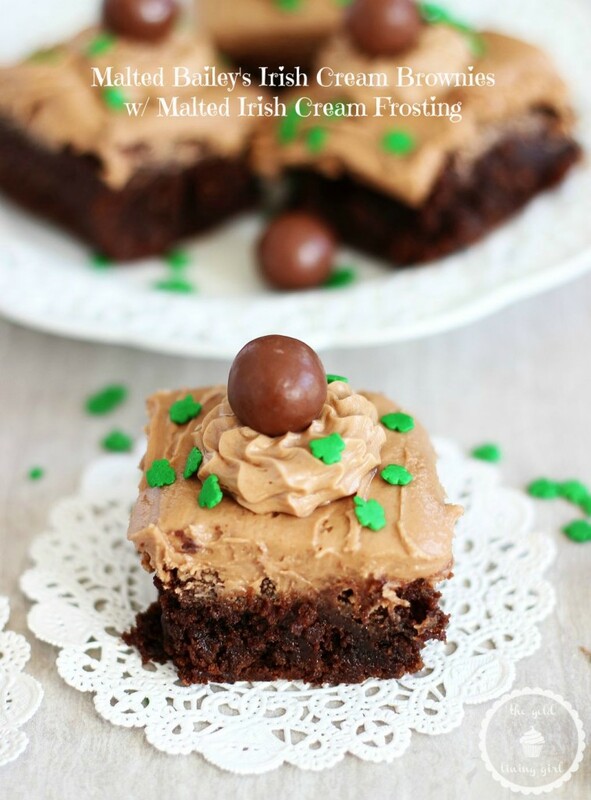 If you like Irish cream, you would love them! Ok, I am totally with you when it comes to St. Patrick’s Day. I feel like I’ve already used up my ideas and I don’t even know where to go from there! 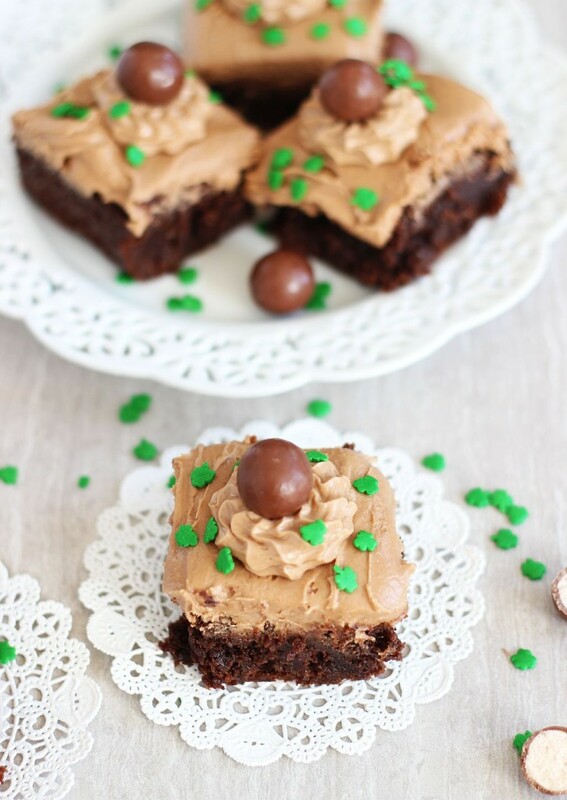 I think these brownies totally put on the right track though because they look soooooooo good! Pinned! These brownies look totally irresistible, Sarah! The malted milk balls are so fun and I love the Bailey’s! 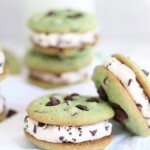 These are perfect for St. Patty’s Day! I’m definitely struggling with the St. Patrick’s day recipes, too. I definitely need to get onboard with that! This brownies look delicious, Sarah! I love the baileys in here. So delicious! Bailey’s in the brownies AND the frosting? Sign me up! The little shamrock decorations are a nice touch too! These brownies look so good. Don’t worry I don’t drink much either, so I wouldn’t know what to do with them either. And I love your wine comment. I’m gonna tell my hubby that I am just drinking juice. Gonna make these brownies for my hubby work. They will die for them.. Pinned! I am all about these!! That frosting sounds to die for. Baileys is the best! My grandmother use to give us boxes of Whoppers all the time. I loved them! This looks scrumptious and I can’t wait to try it! Thanks for linking up at Found & Foraged. Thanks so much for the party, Kyla!! Love that your Grandma used to give you Whoppers… so sweet! Mmmm, and here my daughter and I were just saying how much we both are craving chocolate. 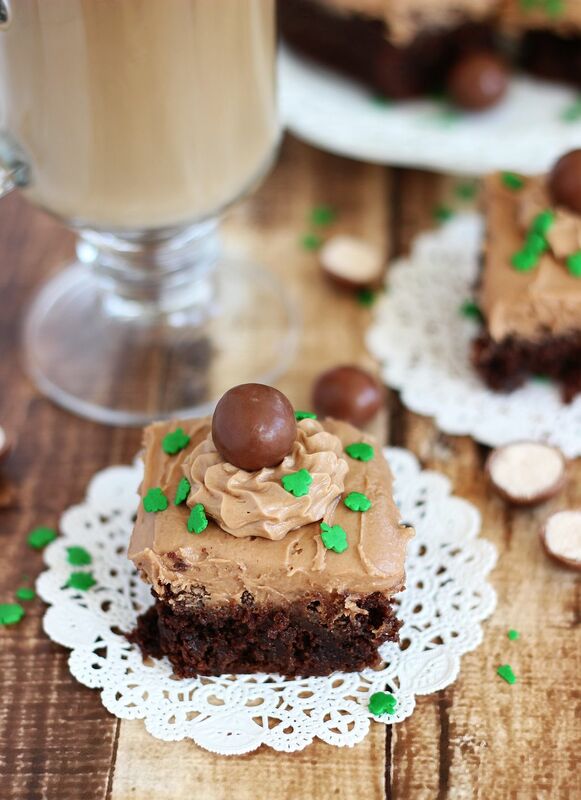 Now I’m craving malted baileys Irish Cream brownies. Thanks for sharing at the This Is How We Roll Link Party on Organized 31. Oh great! Thank you! So glad you like them! Ok I’ll take 3 or 4 please! 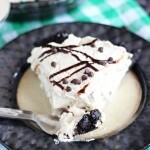 Looks so decadent and I love the flavor combinations going on! Visiting from Inspire Me Monday. Pinning for sure! 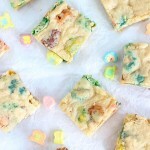 OMG these looks sinfully delicious! Thanks for sharing at The Project Stash! What delicious-sounding brownies! What brand of malt powder do you use? Thanks! Thank you so much, Cathy! They’re very festive! Looks so delicious! Shared….Thanks for coming to the Inspiration Spotlight party! I love that these are super easy. Featuring your frosting / brownies! Hope to see you again soon. Thanks so much, Rosemary! So glad you like the recipe! Oh great! Thank you so much for the feature! These brownies look so good that I want to make a 9×13 pan of them. I can get a brownie mix for a 9×13 pan but do I have to adjust the amounts for the other ingredients? No, you don’t! I made them in a 9×13 pan initially, actually, and everything was just a little bit thinner, but they turned out perfectly! This looks so delicious! We featured you at The Project Stash…stop by and pick up your featured button. We can’t wait to see your latest creation(s)! Thank you so much, Cydnee!! So glad you like it, and thank you for the feature! Thanks so much, Christine! I’d love to join the party! I know… someone else told me it’s St. Paddy’s, but I cannot get away from St. Patty’s with Ts! I Googled it and it seems pretty accepted to use the Ts these days, even if it’s not technically correct. Haha! Thanks so much! Sarah, these look amazing! Thank you for sharing. You are one of the features at the Make it Pretty party. Thank you SO much for the party, and for the feature! !